There are hundreds of resorts around the world that offer some of the best views and exceptional service. It’s becoming really hard to pick one that will be equally affordable and decent. People that love to spend their holidays somewhere on a tropical island waste days, if not weeks trying to find the best spot(s). Lombok, the world-famous Indonesian island, has been a magnet for foreigners for many decades. As for the Mawun Beach, it’s got everything you could possibly dream of. The sand is nice and soft; the waves are enchanting; the neighboring villages are home to the nicest people; the prices are more than reasonable; the scenery is breath-taking. What else is there to wish for, right? This beach is one of those places that make you forget about the rest of the world and focus solely on your time there. Some spots in Lombok are more suited for loners; others are perfect for a nice family trip. The Mawun Beach is like the golden middle: you’ll have fun there either way. Usually, when you look at the photos taken by professional photographers, everything looks exceptional. However, once you arrive at the place, you instantly see a huge difference and the entire trip turns into a compromise. Disappointment – that’s what many tourists feel when they trust the ads and go for the cheap offer(s). Thankfully, that’s not the case with the Mawun Beach. What you see is what you get, and that’s probably its biggest selling point. Historically, the beaches and other landmarks in the Southern parts of the island aren’t nearly as popular as the rest of them. At the same time, they are just as good, if not better. The locals know about these places and call them the “hidden gems” of Lombok. As for the experienced tourists that have been to the island more than once, they aren’t quick to share their knowledge of these wonderful spots with the rest of the world. Why? Because then they would become crowded, ruining the initial charm. The greatest thing about the least popular landmarks like the Mawun Beach is their unpopularity. If you generally love the beaches of Lombok but can’t stand how cramped up they are and don’t really like the noise, then a place like this one will be ideal for you. It’s quiet, peaceful, and allows you to relax like a king: sipping on a drink and reading a magazine while your bare feet are in the sand and you’re lying in an incredibly comfortable chair. On the other hand, I gotta say that the not-so-popular places usually come with a bad infrastructure and there’s always trash lying around, turning an otherwise marvelous trip into something entirely different. The Mawun Beach is actually a part of a big bay and comes with two hills on both sides. They make the place look majestic and you’ll feel protected by them standing in the middle. Most of the beach is covered in white sand: it’s nice and soft. However, as you move closer to the west side, you’ll feel the sand becoming rougher. Plus, that part of the beach is covered in rocks. If you’re a surfer and want to try your luck, remember that the waves in the middle are steeper than anywhere else. Now, the waves carry a lot of trash from the other side, turning the shore into a dump. The Indian Ocean is contaminated – it’s a known fact – and keeps ruining this beautiful spot. The hills I just mentioned are doing a great job of protecting the left and right sides of the Mawun Beach from this pile of trash. So, if you want to escape it, move further away from the middle. I bet after all this you’re thinking Mawun doesn’t really deserve a visit, but that’s not really true. Apart from the rubbish here and there, it’s still one hell of a heavenly beach with just the right waves, sand grains, and chill atmosphere. You’ll see new people arrive at the beach every single day. And while the number of visitors isn’t really that impressive, I’d say that the Mawun Beach has a strong “fan-base” that appreciates what it has to offer – despite the downsides. Interesting fact: the locals usually visit the beach early in the morning, while the sun is still “sleeping.” They’re used to the hot climate of Lombok and prefer the cool wind blowing in their faces. So, at noon, you probably won’t see any citizens of the island. The tourists, in turn, come for that burning sun to get a tan. Yes, the two groups are entirely different from each other, and you’ll have to decide for yourself whether the colder morning is better than the super-hot noon. 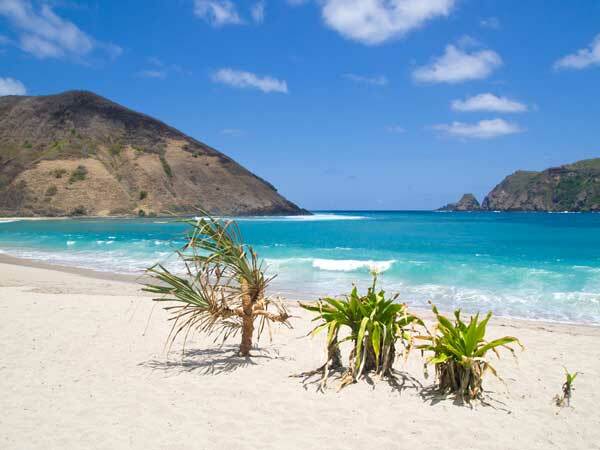 If you head to the Mawun Beach when it’s hot, don’t forget your favorite hat, sunblock, and glasses. The thing is – your body doesn’t have any protection against the sun and you might get burnt. Swimming, reading, and walking around are the best activities there. Families that travel with kids should choose the west and east corners of the beach because of the calm waves and the clean shores. Those spots will be almost perfect for the little ones. The foreigners will probably have their phones out, trying to take the best selfies near the ocean. Even if you’re not a pro photographer, the beautiful views of the Mawun Beach will make sure every single picture looks good and is full of that island atmosphere. For a better view, climb one of those hills I mentioned earlier; they offer some of the best seats on the island. Is This Place Worth All The Trouble? Remember: there are no lifeguards in the area, and the water is contaminated. Therefore, think twice before you decide to go for a swim in the middle of the beach. The roads in this part of Lombok are in a pretty horrible shape. There aren’t any food stalls in the vicinity (the warungs are far away); that means you’ll have to bring your own snacks and drinks. Accommodation-wise, the Mawun Beach isn’t particularly impressive either. You’ll have to do some walking before you reach the closest hotels (same goes for the restaurants). On the bright side, the island is not really that big, and even if you’re renting a hotel room on the other side of it, the ride to this spot won’t take more than 3 hours. Summing up, I have to say that this isn’t the finest beach in Lombok. It’s trashy, has a week infrastructure, and is located on the outskirts, away from where the fun is. On the other hand, all those downsides won’t really matter if you put privacy and serenity first. Yes, it all depends on your personal taste and preferences. One of the undeniable advantages of Lombok over the rest of the tropical islands is that everything is affordable there. So, for the people that are on a budget, the Mawun Beach offers an amazing opportunity to have a great time without spending every single penny on the trip. Alright, it’s time to talk about the location of the beach. Generally speaking, it’s in the Central Lombok District. The exact address is Desa Tumpak, Kec. Pujut, Praya, Kabupaten Lombok Tengah, Nusa Tenggara Bar. Most foreigners land at the Lombok Airport. The rest arrive from Bali on a boat or a helicopter. From the airport, the ride to our destination won’t take more than 45 minutes on a slow day. The road is only 20 kilometers long. Sitting in the back of a taxi, you’ll have a chance to see how the locals live and what the island looks like. The fans of thrilling experiences will probably want to rent a car or a motorcycle. There are several renting spots near the airport, and they’re all relatively cheap. Public transports don’t really go to the Mawun Beach, but you will be able to catch a bus that at least heads in that direction. The drive from the big city of Mataram will be almost twice as long. But it will give you an opportunity to see even more of Lombok. The Christmas holiday season is usually when people leave their cold homes and travel to tropical islands like this one. A change of scenery is exactly what you need to gather your strength and do more in the New Year! The huge piles of trash were an unpleasant surprise for us. But the sides are decent, just like the author said. The sides are a bit trashy as well, but nothing critical. You can buy food from the warungs: it's cheap and tasty. The roads are a challenge. There are no /cafes/hotels in the area. The beach is ok I guess. If you put peace and quiet first, this beach will allow you to relax and have a good time on your own terms. At noon, the Mawun Beach is almost completely empty during the low, season, which is a bit creepy, to be honest.